We got interested in this problem because we needed to use small user stories so that we could fully complete them in a sprint. On one project this was causing the testers to observe that if we could group the stories to make distinctions between groups of stories within a sprint, then the testing could be planned more effectively. Even following the rule of making stories independent it seemed a reasonable point - context switching would be easier. The epics were too broad to help with this, which also made it challenging to be clear about when an epic was expected to complete. On another earlier stage project it was hard for to see which stories were essential to progress to the next stage. In all cases it was resolved with a fairly quick discussion, but we were still left without a good way to capture this information in JIRA. Essentially we needed a lower level of grouping than what we’d been using the JIRA epic links for. Group the user stories by something with a higher level intent than the individual stories, but not much higher. When you start working on this group, you should know what all the stories are. There’s a chance something will change and you’ll need to add, modify or remove stories, but that should be limited. If you don’t at least have a draft of this, then you don’t know it can be finished in three sprints. 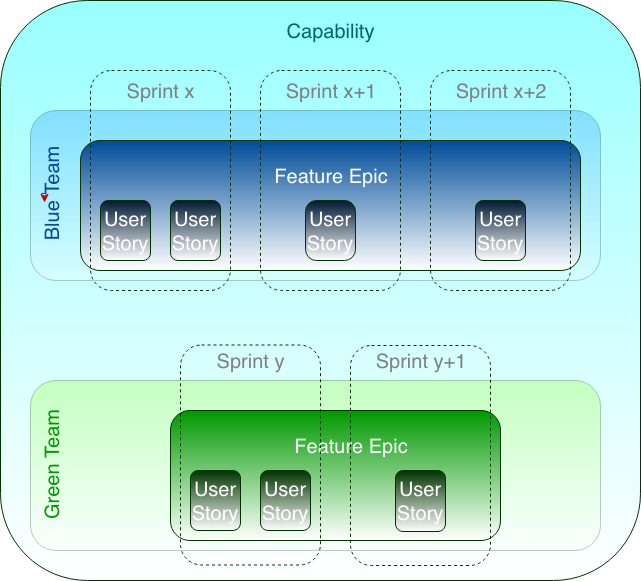 We had been following the default JIRA pattern of having user stories grouped by epic. The epics lasted too long and contained too many individual stories to specify the level of intent of the small groups of stories being worked on. Since JIRA makes the “epic link” prominent in the UI, and we were using that anyway for grouping, the easiest way to get the benefits of this new “feature” grouping was to make the epics at the level described above. This didn’t appear to lose any benefits of clarity of reporting progress at the higher level - in fact it possibly made it easier, because we could be more sure about what we would communicate about the new more granular “feature epics” than before. We have appropriated another SAFe - style term though we’re using it with some simplifications, so as well as noting that our JIRA “Feature Epics” aren’t at all the same as SAFe Epics, see the diagram below for how a “Capability” is delivered.